Elaine Hancock (Olney, United States) on 6 July 2014 in Landscape & Rural. The great thing about history of agriculture. B & W fits nicely habit to tell about it. . . and clearly made to last a lifetime or more ! Quelle vue de ces anciens objets sueprbe compo et vue. Delicious, a very lovely image. Bien vu le noir et blanc pour cette photo !!! Although seen the black and white for this photo! Superbe B&W j'aime beaucoup le cadrage! Great tones and details, fine B/W image. Excellent black and white work. The aged wood of the barn is spectacular and the light falling on the tools makes them jump out. I love this stilllife BW. Nice light and great choice of contrasts. Beautiful quality of contrasts & tones. 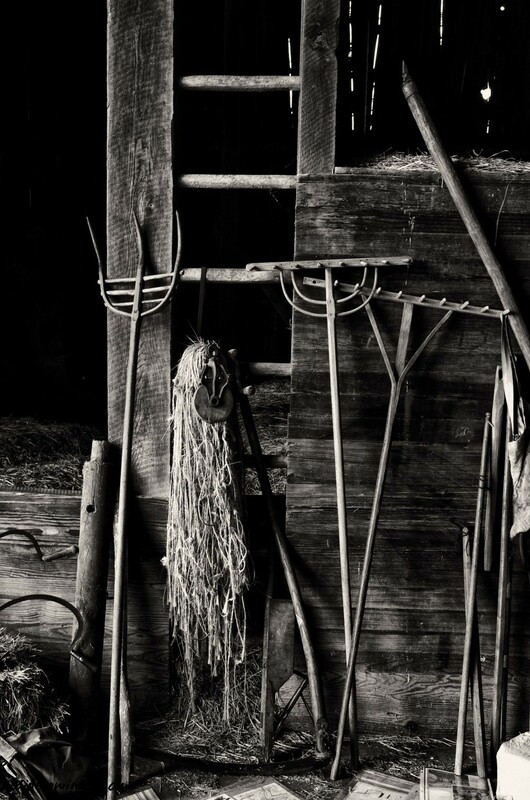 A fabulous photo in every way .. beautifully rendered in mono .. wonderful collection ..
A very strong black and white interpretation of these old farm tools. Very well done. Un beau cadrage !!!! super effet noir et blanc . Great shot. well captured and well treated. I really like it ! Excellent photo, nice shot, great B/W ! Superb B&W and amazing details with a great story behind. Nice framing. such beautiful frame, lighting & details! Love this kind of image a lot. Well done. Tells a lot of stories. Nice B&W. 5* image. Lovely B&W with the fantastic tones and light..
Looks like a scene out of an old movie...Love the mood here ! Love this ... awesome mood, rich b/w and tone! Fantastic, Elaine!